In the Zone is the region’s leader in Sports Themed Birthday parties and is the perfect place to celebrate with an End-of-Season Team party. Having hosted thousands of parties and tens of thousands of children, we’ll make sure your experience is positive, memorable and hassle free. Normally 2 activities for 30 minutes each. We recommend 3 activities for 20 minutes each for 7 years old and below. Backyard Games Play red light green light; freeze tag; duck, duck, goose; and others for some good old-fashioned back yard fun. Basketball 5-on-5 full court or 3-on-3 half court tournaments, foul shooting contests, 3-point contests, knock out and / or a skills contest -whatever your heart desires. Floor Hockey Wear sneakers and play with a plastic puck (no checking or fighting allowed). Dodgeball Just like we used to do in gym class. Kids love this classic!! 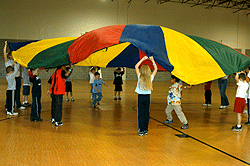 Parachute Games Kids grab onto our 24-ft. diameter parachute and play popcorn, knock off, crossover, up and under, and other fun games. Relay Races Sprinting, hopping, wheel barrow, skipping, backward sprints, and more. Kick Ball Just like back on the play ground–in this baseball style game, kids kick the ball instead of batting. Great for the little ones!! Soccer Played on basketball court with a softer, indoor soccer ball. Volleyball Ace! Dig! Play a fun game of backyard volleyball or have a true competitive game. Wiffle Ball Bounce it off the wall for a home run!! We handle set-up and clean-up! Party guests need to stay with the party and participate in the activities the birthday child has selected. If a guest does not want to participate in the selected activity, they sit in the bleachers and watch. We can’t have kids all over the facility doing whatever they want. The party stays together. The party coordinator has the authority to keep a guest from participating in a given activity. For example, a 13 year old older brother might be playing his hardest against his 7 year old sister’s friends and the coordinator thinks he may hurt someone. Also, for safety reasons, parents should not play against the kids. Please note that the parties (to include activities, drinks, food etc) are for the invited party guests only and do not extend to parents, aunts, uncles, cousins, siblings, sibling’s friends, neighbors, etc (unless of course they are invited party guests). The other areas of In the Zone (i.e. basketball courts, fitness center) are NOT open to party spectators unless they pay the appropriate usage fees. For example, if a group of parents want to play basketball while the party is going on, they need to pay the fees. Additional pizza for party spectators may be purchased at a discounted rate of $12/pie. Drinks are available at the snack bar at published prices or we can run a tab for the party. No outside food or drink is permitted other than a birthday cake. We don’t have a freezer so no ice cream or ice cream cakes. Have your guests wear appropriate attire (sneakers, etc). We usually have parties running back to back. We need to start and end on time. Please plan accordingly. Large parties (+24 kids) need special consideration and are limited to certain times of the day. $50.00 deposit required when booking a party – remainder due on the day of party. Deposit is non-refundable if party is canceled within 14 days of the party. Parties appropriate for 5-16 years old; average age of party 7-12 years old. Party favors available for $3.00 each. Favors are plastic sports water bottles with candy inside.